It’s been a year since we started this blog and we’re still with it! Yay us. Hopefully a number of you are still with us as well. 🙂 In honor of the auspicious occasion, we decided to make a couple of sparkling wine cocktails since we’re in a celebratory mood. 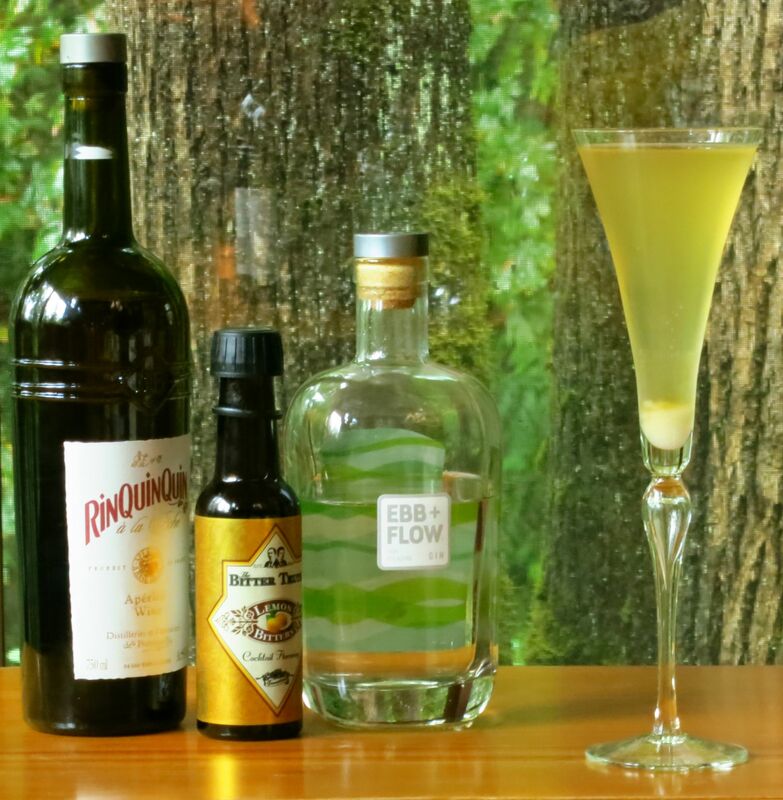 This week, we wanted to create sparkling wine cocktails using the RinQuinQuin (a recent addition that we haven’t put through its paces yet) and apple brandy, since it is tasty and autumnal, and we haven’t often seen it in combination with sparkling wine. Put several drops of lemon bitters on the sugar cube. Place sugar cube in bottom of a champagne flute. Stir first 3 ingredients with ice. Strain into the flute. Top with champagne or sparkling wine. Nose: Lemon, peach and little bit of juniper. Palate: Sweet cooked peach and slightly astringent wine at the front. Strong juniper and a little anise on the mid-palate along with a bitter bite. Medium-dry finish with bitter lemon notes. Stir first 4 ingredients with ice. Strain into a champagne coupe. Top with champagne. Nose: Apple, lots of apple, clove, black pepper, oxidized barrel notes. Little hint of cinnamon. Palate: Sweet apple (like Jolly Ranchers, but in a good way) to start. Big hit of spice on the mid-palate – allspice, clove, cinnamon – along with some dry wine-y notes and some barrel wood. Medium-dry finish with apple flavors and a little bit of tannin. 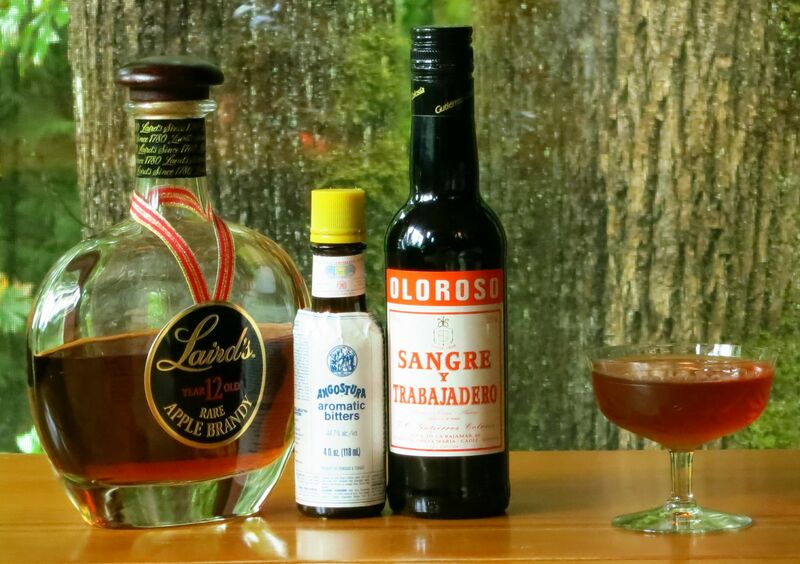 This entry was posted in apple brandy, calvados, champagne, gin, oloroso sherry, sparkling wine and tagged anniversary, fox bushel cocktail recipe, laird's 12 year apple brandy, oloroso sherry, rinquinquin peach aperitif wine, sound spirits ebb + flow gin, time flies cocktail recipe. Bookmark the permalink.